These knives are fantastic to take along anywhere, and are very tough and well built. Keep them in your car, tackle box, rock climbing kit, and more! High quality construction at a low price! You can't beat the value! 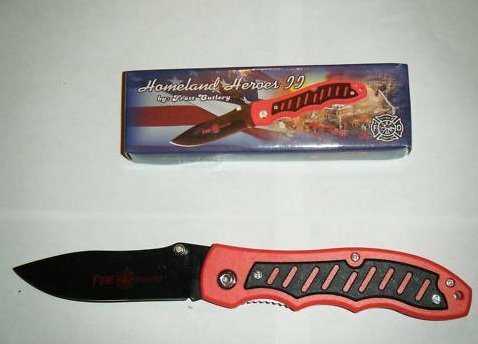 *****Here we have a brand new Homeland Heroes 2 Firefighters Locking Tactical knife. Don't confuse this knife with the Homeland Heroes 1 knife, this one has the finger grips. We have 12 of these in stock! It is 4 1/2 inches closed with a liner lock, so once the blade is open it is locked until you decide to push the lever to close the knife. You can also start to open this with your thumb and then with a flick of your wrist open the blade the rest of the way for a faster opening. The blade is black coated Stainless Steel and has a thumb stud for easy one hand blade opening power. The words Fire Fighters and their emblem is also printed on the blade along with the Frost Cutlery manufacturer markings, so you know this is a great knife. The handles are red composition with a black slotted grip. The end of the grip even has a lanyard hole so you can fit this on a chain or fishing line for when you need a knife immediately. The back of the handle also has a metal pocket/belt clip for easy access too. Note: This knife has an adjustable tension setting, and as with most locking knives, you may have to use it a bit to loosen up the locking mechanism or make minor adjustment to loosen or tighten the blade release to your preferences. The composite material is easy to grasp and the curvature of the handle just fits right to your fingers like it was made for your hand. If you're looking for newer knives like police, military type designs or cool and unique pocket knives, we have them.